Your treat trough is empty. That's our goofy little Gus! 10/8/10: A Man and His Dog. 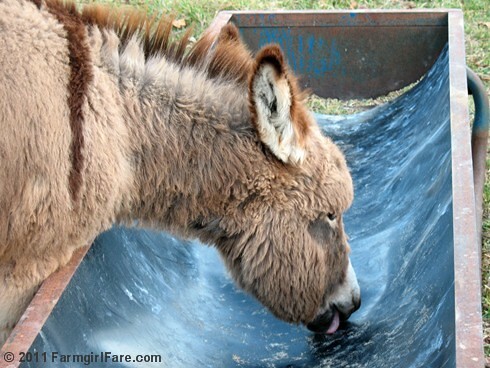 . .
© FarmgirlFare.com, the seriously deprived foodie farm blog where it's all about the treats—and as you can see, there's nothing subtle about our donkeys.
.::He appears to be giving you Stink-Eye as he licks the tarp. Too funny, Gus !~!::. Irresistibly cute! Nothing like licking an empty dish, I always say! Works wonders! Is there anything more pitiful than a treat-deprived donkey? So cute and so funny! And oh those ears !!! I love the donkeys! They have such wonderful personalities! My cat does that too! They somehow seem to make it so pitiful: "I haven't eaten in days." Gotta love the critters. Aw, he wants a treat. one of my cats does it, too. First, she sits in front of her food bowl, and then she licks the empty bowl. Makes me feel really guilty. Some donkeys can be excellent livestock guardians. I have a friend whose donkeys won't even let the family dog into their pasture. While we were hoping our donkeys would help protect the sheep from coyotes, they don't seem to be that kind of donkey. ;) Fortunately Daisy and Marta, our livestock guardian dogs, are doing an excellent job of keeping away all predators. As for donkey books, we've been enjoying a new book from Hobby Farms called Donkeys: Small Scale Donkey Keeping. It has lots of helpful information, especially for beginning donkey owners, and is a bargain from amazon.com for just $8.94. Another good book is The Donkey Companion: Selecting, Training, Breeding, Enjoying & Caring for Donkeys. 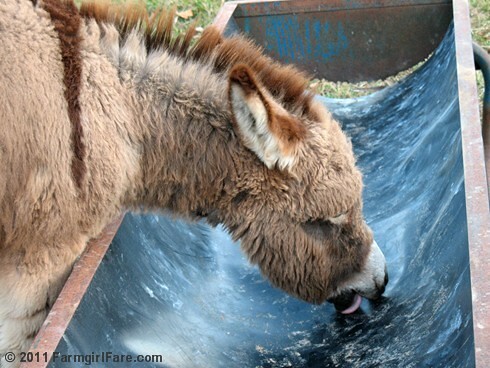 You can also find some good information on The American Donkey and Mule Society's website, LoveLongears.com.